As you all know that we can install more then one Operating system in one computer. This process is called Dual Booting, where we install two operating system in one computer. Many of you all know that we can install windows XP with Windows 7. and other operating system with windows also. like windows XP and Ubuntu, windows 7 and Linux. There are many. But today I will tell you how to install windows 8 with windows 7. Windows 8 is the newly launched windows version of Microsoft and it is very smart in look, faster in performance and there are many features. Before we start I recommend to please make a back up of your hard disk. Because if in case you miss some thing or you do wrong you can get back all your data. For back up you can use Norton Ghost or Acronis True Image which is one of the best tool to get back up. First we will create a portition on windows 7. As I expect that all of you have Drive C: as your main drive. So we will create partition on C:\\ (minimum size of 30-40 GB). 1) Open Run or press Win+R on keyboard. Type "diskmgmt.msc" to start Disk Management. 2)Now a window will open with your HDD details. There on C:// you have to make a partition for windows 8. For that just right click on the Drive C and click on the Shrink Volume Option. 3) After the Complete of the Shrink, right-click on the unallocated partition, then select New Simple Volume. Click on New Simple Volume Wizard and make sure to format the new partition in NTFS and give it a volume label, like "Windows 8." 4) After this you have a free space which you have shrink for Windows 8. now We will install windows 8 on this free space. 5) Now insert the Windows 8 bootable disk or USB on your PC , and Reboot your system. Press any key on the booting of the system to start booting with your bootable DVD or USB. 6) Now follow the simple steps to install Windows 8. When it will ask for the type of Installation then select Custom Installation. 7) Now select the Partition that you have created with name as "Windows 8" for the Installation of windows 8. After the finish of the Installation. It will restart the PC and Shows Two operating system on the main boot window. As normally It will starts windows 8 as a default OS after 30 seconds. But you can change the default OS to windows 7 by clicking "Change defaults or choose other options" from the boot menu. 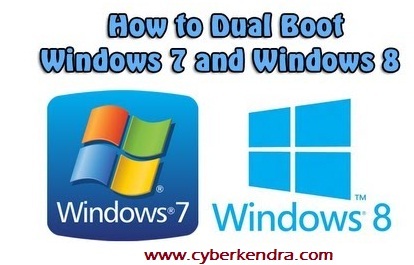 Now enjoy two operating System on one PC as Windows 7 and Windows 8. Hope you get all the process.